Though it highlights just one year of writing, this third volume of The Collected Stories of Ray Bradbury represents a crucial moment at the midpoint of his first full decade as a professional writer. 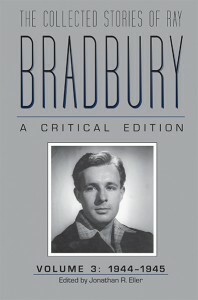 The original versions of the 1940s stories recovered for The Collected Stories of Ray Bradbury, presented in the order in which they were written and first sent off to find life in the magazine market, suggest that Bradbury’s masks didn’t always appeal to his editors. The Volume 3 stories were all written between March 1944 and March 1945, and the surviving letters of this period reveal the private conflict raging between Bradbury’s efforts to define a distinct style and creative vision at home in Los Angeles and the tyranny of genre requirements imposed by the distant pulp publishing world in New York. Most of the twenty-two stories composed during this pivotal year in his development reflect the impact of these creative pressures. This period also produced important markers in his maturing creativity with “The Miracles of Jamie,” “Invisible Boy,” and “Ylla,” which were among the first wave of Bradbury tales to reach the mainstream markets. The early versions of Bradbury’s stories recovered for Volume 3, some emerging from his surviving typescripts and several that restore lost text preserved only in the rare Canadian serial versions, provide an unprecedented snapshot of his writing and his inspirations. Underlying this year of creativity was the expanding world of readings in modern and contemporary literature that would prove to be a crucial factor in his development as a master storyteller. The Collected Stories of Ray Bradbury is edited in compliance with the highest scholarly standards by the Center for Ray Bradbury Studies and bears the Modern Language Association’s seal of approval for scholarly editions. Each volume includes a general introduction, biographical timeline, summary of unpublished stories, historical commentaries for each story, textual apparatus, and a chronological catalog. AuthorJonathan R. Eller is Chancellor’s Professor of English, director of the Center for Ray Bradbury Studies, and senior textual editor of the Institute for American Thought in the Indiana University School of Liberal Arts (IUPUI). He coedited Volume 1 of The Collected Stories of Ray Bradbury (The Kent State University Press, 2010) with founding editor emeritus William F. Touponce, with whom he also coauthored Ray Bradbury: The Life of Fiction (The Kent State University Press, 2004). Eller edited Volume 2 of The Collected Stories of Ray Bradbury (The Kent State University Press, 2014).